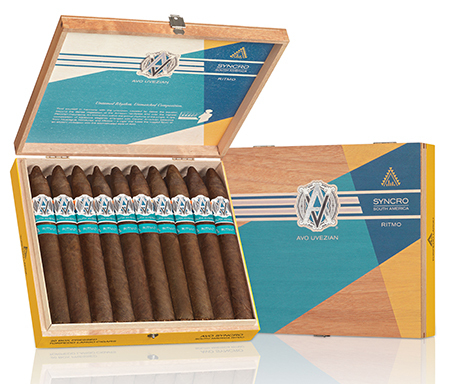 AVO's Syncro South America Ritmo (Spanish for rhythm) cigar line is the third release in the company's Syncro series and is composed from a rare blending of tobaccos from Peru, Brazil, and Ecuador elegantly fused with Central American tobaccos from Nicaragua and Mexico. The Ritmo's beautiful Ecuadoran wrapper covers untamed intensity and complexity within, which is revealed at first light. Deep flavors of roasted nuts and black pepper move seamlessly into the complexity of exotic filler tobaccos, further awakening the palate. Spiciness and earthy flavors arrive midway through provided by the Nicaraguan, Peruvian, Brazilian, Honduran, and Dominican filler tobaccos and sync perfectly with the sweet chili notes from the Mexican binder. Unique cocoa and black coffee flavors remain prominent near the finish as a rich creaminess emerges. You'll savor every note. The AVO Syncro South America Ritmo box-pressed cigars are hand rolled at Davidoff's Oettinger Kelner Cigar Factory in the Dominican Republic.